1. Go to the contest's page and click Upload an Entry. 2. You will be given two options on how you wish to submit your entry. I want to submit an entry right away - This lets you participate in the contest and submit an entry to it at once. If you've already made your entry, you can choose this option. I am participating in this contest - This lets you inform the contest holder that you will be joining the contest without submitting an entry at once. You can submit your entry at any time after you participate the contest as long as the contest is still open for submission. If you choose the second option, you can go back to the contest page when your entry is ready, and click Upload an Entry. 3. On the entry submission form, enter the title and details of your contest entry. 4. 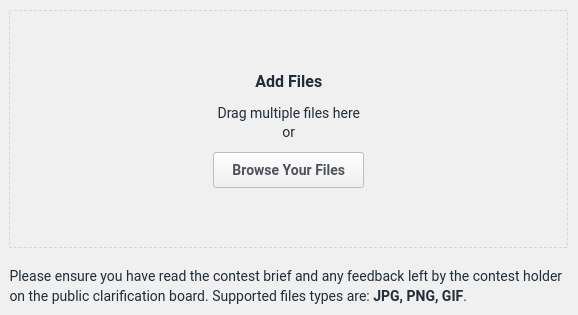 Upload your entry file/s by either clicking Browse Your Files or dragging and dropping the file/s to the Add Files box. The supported file formats for entries will depend on the type of contest you are participating in. 5. Declare any stock content that your entry may contain. If your entry is your original work without any stock content, tick This entry is entirely my own. If you used any stock content in your entry, choose This entry contains elements I did not create. Enter the stock name and link to the stock content included in your work. Tick Stock requires purchase if it is not for free. 6. As an option, you can also specify your entry's Sell Price. Your employer may purchase your entry at this price even if you don’t win the contest. The minimum sell price amount is $10 USD. 7. From the Promote my entry section, there are two available contest entry upgrades you can get. You may choose to highlight your contest entry to increase your entry's visibility and your chances of winning the contest prize. 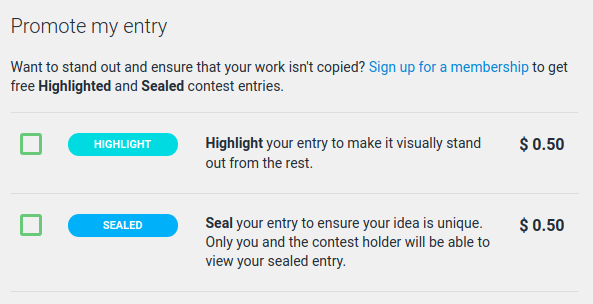 Sealing your entry will keep the entry view between you and the contest holder and away from the competition. These upgrades are free at a certain number per paid membership plan. Otherwise, they are only $0.50 USD each. 7. Tick the checkbox to confirm your entry's authenticity and your acceptance of the site's Terms and Conditions. Click Post My Entry once done. What is the Sealed Entry Upgrade? What is the Highlight Entry Upgrade?